Remember the TV show "One man and his dog"? Border Collies have been bred specially to work sheep in the Lake district since the early 1700's, so it's an age-old relationship between sheep and dog, but it's one which also requires the skills of the dog-handler. And that is where your challenge begins as you try the exciting, fun and rewarding experience of sheep dog handling. You'll first learn all about Border Collies and then try handling one of these friendly and fully trained sheepdogs in the field with real, live sheep (with the helpful advice of an expert handler!). This is a unique chance to try something truly different, a world away from the usual holiday attractions. 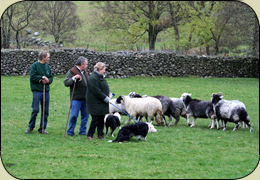 These sheepdog handling courses are suitable for absolute beginners, and are provided as one-to-one or group tuition. The farm has a team of working sheepdogs all of which are trained to work with members of the public. At the end of your instruction period, you'll work with your dog to move sheep around a course to test your skills - and get a certificate to prove you did it! This exciting, entertaining Border Collie sheepdog handling experience must be booked in advance as this is a working Lake District hill sheep farm. The owners still farm the traditional Herdwick sheep in the outstandingly beautiful Duddon valley between Langdale and Eskdale, Coniston and Broughton. 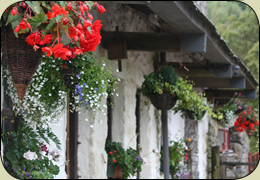 Call them to book an experience where you can meet the farmers, the sheep and the fantastic sheepdogs. Alan (left), teaching a couple the magic of sheepdog handling. (Right) the sheepdog kennels in summer. Please email if there is no phone answer as the farmers will be at work on the fellside with their dogs.